We all strive to be successful. Whether it’s success in our profession or our personal lives we want to be our best at whatever we do. How can we insure our success in all of our endeavors? What can we do to have an edge? If you have run in a race you know that there is a wall that you hit that seems impassable. It can stop you in your tracks or motivate you to push threw. But, it requires calling on ever last ounce of effort. Sometimes that extra effort isn’t enough. Sometimes our best efforts and shear strength is not enough. What do we do then? Give up? Make excuses? Jesus gives us insight into how we can succeed in life. Wait a minute! That’s got to be a misprint! I am an adult who is able to do anything. How can Jesus say such a thing? He can say that because He knows that we are only able to do so much while we live this life. We can get by for awhile but to be successful in this life – in a way that is important to God – we need to be connected to the source of power and strength. and He uses the example of the vine and branches to illustrate His point. The Word of God is full of people who were incapable of great things in their own strength but will God did mighty works. Abraham, Moses, Gideon, Samson, Paul, Peter and many more. His grace is sufficient for them and is also for me – and You too! This entry was posted in Inspirational and tagged 1Cor 10:13, 1Cor 9:24, 2Cor 12:9, Devil, Heb 4:15, Humility, James 4:7, Jesus Christ, John 15:5, New King James Version, Phil 1:6, Resisting the devil, Running the race of Life, Sin, Temptations, Trials, Trust in God on July 13, 2015 by tknot57. How do we react to instability in our lives? 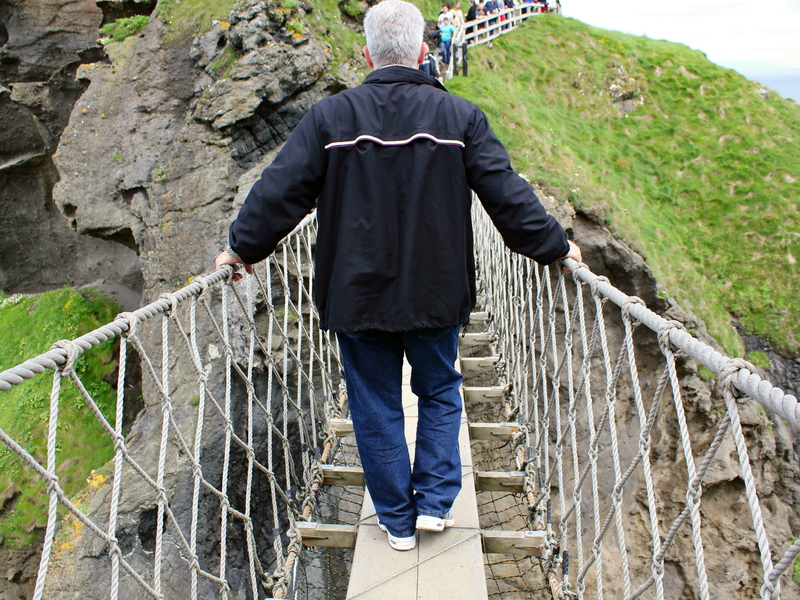 Do we frightfully hang on for dear life, as I did while crossing this rope bridge in Ireland, or do we rest easy knowing we are in the Fathers arms? I never have been much for heights. Although I have been to the top of the Empire State building without a care and if needed I can walk most roofs but you couldn’t get me on a roller coaster until recently. I think the reason behind my fear of certain heights was control. If I felt like I was in control of the situation I wasn’t afraid no matter how high I was. But we aren’t always in control of our environment or the conditions of the road ahead of us. What then? Fearfully clinging? Or resting easy? What would the Word of God encourage us to do? How would Jesus hope to see us react? 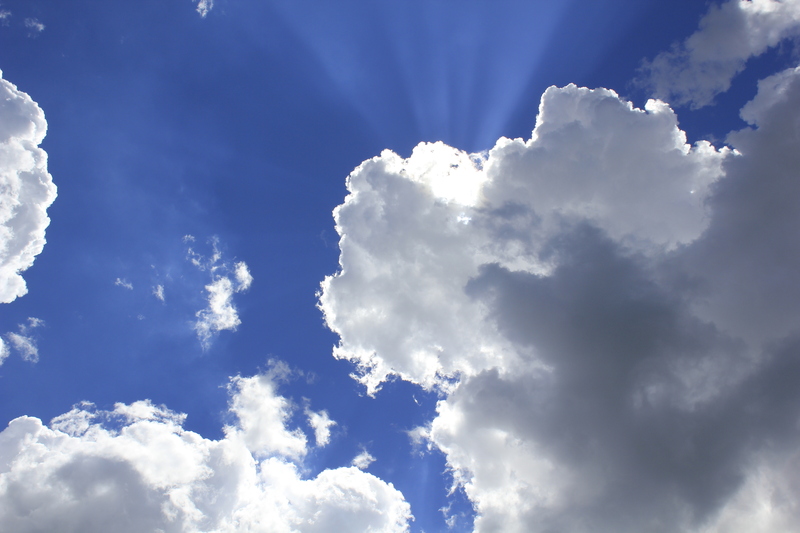 I am reminded of a circumstance that Peter found himself in. Matthew records the event here. While in a storm swept boat with the disciples Peter calls out to Jesus Who is walking on the water towards them. Peter asks Jesus to let him come to Jesus on the water and Jesus calls for him to come. Peter steps out of the boat and walks on the water to Jesus – UNTIL he takes his eyes off of Jesus and looks at the storm – THEN HE SINKS LIKE A ROCK! The disciples were fighting that storm for hours. Truly an unstable environment. Yet when Peter saw Jesus and kept his eyes on Him he overcame the circumstances around him and did the impossible – he walked on water. But when he “looked around at the high waves, he was terrified and began to sink“ (vs. 30 TLB). But, remember, the high waves and rough seas were there before he stepped out onto the sea, they just weren’t the focus of his attention. So, clearly we all need to remember that when the waves and storms and instabilities of life arise, we can rise above them if we focus on Jesus and not the circumstance. The following is a short list of encouraging words found in Gods Word for us all to hide in our hearts for a rainy day. My Friends please hold His words close to your hearts because the Word tells us that there will be a time of unprecedented instability in the future (maybe our future, maybe in some distant time) but we can stand the times of emotional, economic or social instability if we stand in HIM Whom first placed our feet on solid ground. Carrick-a-Rede Rope Bridge is a famous rope bridge near Ballintoy in County Antrim, Northern Ireland. 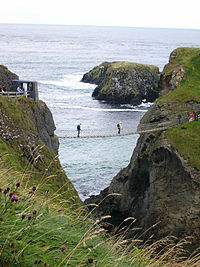 The bridge links the mainland to the tiny island of Carrickarede. It spans 20 meters (66 ft) and is 30 meters (98 ft) above the rocks below. The bridge is mainly a tourist attraction and is owned and maintained by the National Trust. In 2009 it had 247,000 visitors. The bridge is open all year round (subject to weather) and people may cross it for a fee. This entry was posted in Inspirational and tagged 1 John 4 NKJV, 1 Peter 5 NKJV, Carrick-a-rede robe bridge, Economic Turmoil, Emotional Stress, Eph 3:17-21 KJV, Fear, Instability, Matthew 14:22-33, Phil 1:6, trust, Trust in God, Trust in the Lord, uncertainty on December 19, 2014 by tknot57. No matter whatever you may be going threw today please take refuge under His wings and know that He reigns over all the earth and He will save you because He loves you. 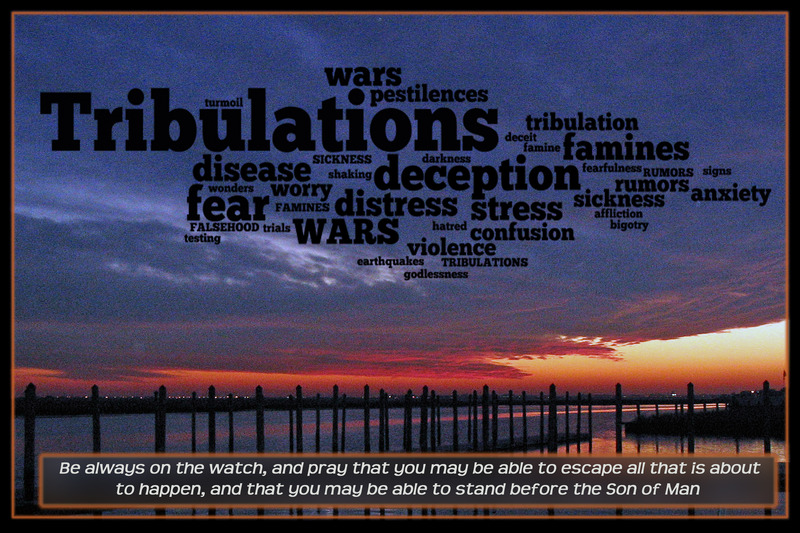 This entry was posted in Inspirational and tagged Christianity, Encourgement., Gods Gift, Gods Love, Jesus, Jesus Christ, redemption, Scripture verses, Thankfulness, The Lord Reigns, Trust in God, Trust in the Lord on December 6, 2014 by tknot57. and if it doesn’t it was never was. For decades this poem, or some version of it, has been set to music, printed on posters and repeated as sage advise to the love lorn youth. But the truth is the concept behind this montra is much older. Its as old as time itself and continues to this very moment. That’s because the concept of setting something, or someone really, free to go and live their life and hope that they come back to you frist started with God. That’s a statement to consider. Taken at face value it says that we all came from God before we came from mommy! The question is will we go back? Just like the poem says – if you love something set it free. God has done just that. He loves us and He set us free. Free to make our own choice as to whether or not we will return to Him or go our own way. Free to believe in Him and His love for us. Free to trust in Him or to venture off on our own. In this culture of being “green” why not consider the ultimate act of recycling and …. This entry was posted in Inspirational and tagged go green, Gods Love, Jer. 1:5, Known by God, Recycling, redemption, retrun to God, self reliance, Trust in God on September 18, 2014 by tknot57.